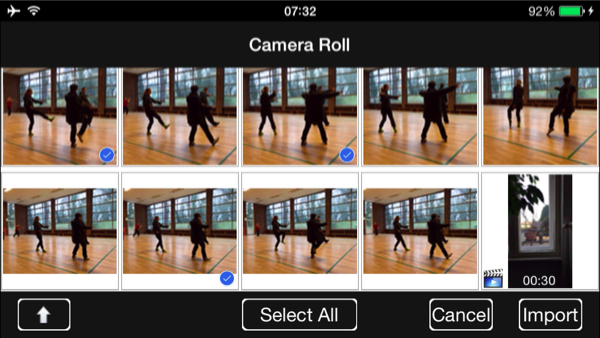 In the pre-release version 1.9.3 of nessViewer App for iOS we have now improved the import of media from the "Photos App": while previously only one picture or video was imported (and then this function must be called again for other media import), multiple media can now be selected and then imported in one step if iOS 8 is installed. Not only multiple media can be selected (by touching), but eg various lists (collections, moments, bursts, etc.) can be selected and their media added to the import as well. Through "Select All", all the displayed media is added to the import (or through "Clear Selection" removed), making the selection of import media even easier. After selecting "Import", the so arranged media are imported from the "Photos App" to "nessViewer App" including existing metadata (EXIF, GPS) - and as this may take some time on greater import, a progress bar is displayed during this time. The import folder will then be opened, if necessary, and the imported media can be managed. All beta testers (with registered iOS devices) can download the modified pre-release version 1.9.3 of "nessViewer App" at the nessViewer download page. Import of multiple media from the "Photos App" with "nessViewer App"